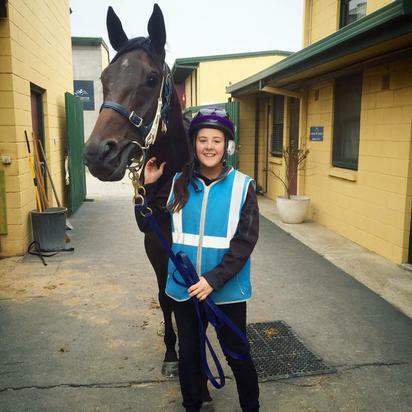 Moloney Racing are excited to welcome a new member to the team, in second-year apprentice jockey, Tayla Childs. Childs, the daughter of duel-Cox Plate winning jockey, Greg, and twin-sister of Group 1 winning jockey, Jordan, recently had her indentures transferred to John, and we look forward to watching her progress towards her first race ride. Have you always wanted to be a jockey and why? Not really! It was always something I thought about growing up, but never followed through with it till after school. I completed VCE year 12, and then decided to take up a university teaching degree. I did 2 years of Uni and although I did enjoy it, I still had the ambition of becoming a jockey and was always thinking ‘what if?’. Michelle Payne won the Melbourne Cup, and that influenced me to apply for the program as I knew it would open up a lot of opportunities for female riders! What annoys you the most? Losing things and not remembering where I put it! If you could only choose one store to spend $10,000, what would it be? Maybe Myer because it’s got everything! Favourite time of the day and why? Probably the end of the day when I can relax and have dinner! Do you have any pets? I grew up on a hobby farm, so a few! Horses, sheep, cows, dogs, cats, chickens and even a peacock! Favourite quote/motto? Dream big, work hard, stay focused and surround yourself with good people. Make it happen.